To start from the beginning though, we actually need to start in Budapest in the 1880s at the home of Theodore Von Karmen. Being a prodigy in mathematics, von Karmen was guided into engineering by his father and eventually directed an aeronautical institute in Germany. However in 1930, when Hitler came to power, von Karem being Jewish, moved to the California Institute of Technology in Pasadena to lead an aeronautical laboratory. In 1936, Theordore Von Karmen was visited by two men, John Parsons and Edward Foreman, inquiring his help in building rockets. Joined by students Frank Malina, Apollo Milton Olin Smith and Tsien Hsue-shen, the Suicide Squad as they were known, sparked an unintended explosion on campus, and the school moved their testing to Arroyo Seco, a dry canyon wash at the foot of the San Gabriel Mountains near Pasadena. This testing eventually grabbed the attention of the military, contracting them for $11,000 in just two years. After helping the military to develop let-assisted takeout for aircraft, the Guggenheim Laboratory began working towards a response to the German’s V-2 rocket, and they did this under the name, Jet Propulsion Laboratory, managed by the Army. The next German to have a huge part in the growth of the American Space Program is Wernher von braun (Verner Von Brown). Von Braun was born in 1912 in Germany and was inspired and fascinated by space travel after reading Hermann Oberth’s “The Rocket to Interplanetary Space” as a teenager. Testing liquid-fueled rockets in his free time, he studied mechanical engineering and physics in Berlin and his work with rockets attracted the attention, once again, of the German army. From there, his work continued to impress officials and Nazi leadership soon noticed and agreed to generously fund his research, so long as he designed and built long-range ballistic missiles eventually known as V-2 Rockets to turn the tide of the war. This however, was not Von Braun’s dream. Still inspired from his youth and for the original reason he went into rocketry, space exploration was still his first priority. Unfortunately though, after overhearing Von Braun talk about this with his colleagues, he was arrested for two weeks because of treason by the Gestapo, or Nazi Secret Police. After this, Von Braun knew that he had to escape and conduct his research elsewhere, so after Adolf Hitler had died, Von Braun and his team of 400 made plans to surrender to the Americans. Initially skeptical to let a Nazi scientist into their ranks, they eventually agreed and took over 300 train-car loads of spare V-2 rocket parts with them. Now finally settled and trusted in America to conduct his own research, Von Braun and his team settled in Huntsville, Alabama. His assignment was to lead the American ballistic missile program, but was permitted to pursue his dreams of sending spacecraft into orbit. 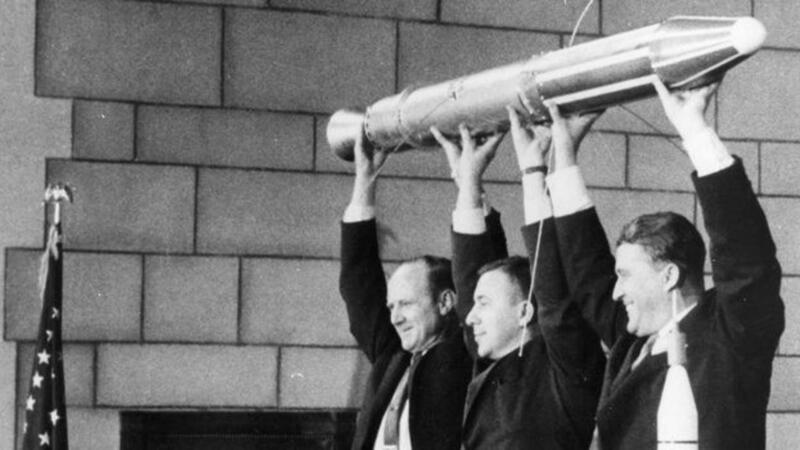 In fact, after the Russians launched Sputnik (the first ever man-made satellite to orbit the Earth) in 1957, Von Braun and his team were not far behind with Explorer 1 in January of 1958. NASA itself however has it roots also in America. On March 3rd, 1915 The National Advisory Committee for Aeronautics (NACA) was a U.S. federal agency founded to undertake, promote, and institutionalize aeronautical research. This was a Committee formed during WWI modeled on similar national agencies across Europe. However, after WWII, President Eisenhower disestablished NACA and established NASA in October of 1958 to command all civilian and peaceful space science missions, separating it from the military. With this, JPL was also transferred from the Army to NASA, turning its attention to the actual scientific payloads rather than rockets, shortly launching Mariner 2 to Venus, becoming the world’s first spacecraft to encounter another planet. The launching then, was left to von Braun. Eventually, NASA’s Marshall Space flight Center was built around Wernher von Braun’s headquarters in Huntsville and he was named its first director. After that, he oversaw the construction of the Saturn launch vehicles, ones that would eventually take 27 U.S. Astronauts to the moon, and 12 to the surface. They have landed multiple times on Mars and are now headed for Jupiter’s moon Europa.